FUN! Billiards and Gameroom Superstore is a 5000 square feet showroom in the Dallas Texas and iss one of the largest suppliers of restored and collectable gameroom supplies and equipment, including pinball machines, pool and billiard tables, slot machines, shuffleboard tables, vintage arcade games and consoles, foosball tables, dart boards, neon signs, and so much more! Shipping from Coast to Coast! AND BEYOND! As a centrally-located dealer and showroom in Dallas, we specialize in shipping all over the world. Feel free to call and ask one of our friendly and knowledgeable team members about your options for ordering and shipping – no matter where you are! An Enthusiast’s and Collector’s Dream! 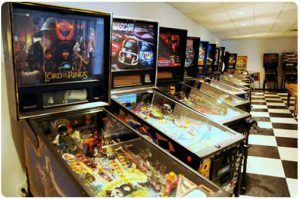 We feature a large variety of rare and collectable gameroom items, and are experts at finding and restoring some of the world’s most desirable machines. Stop by our showroom today and take a look at our full collection for yourself!